Development woes took a toll on EA's loot shooter. According to an extensive Kotaku piece on the developer's internal struggles. Dragon Age 4 development was restarted under a new team as BioWare rushed to prepare Anthem for launch. Work on Dragon Age 4 reportedly started in 2017, under the leadership of Mark Darrah and veteran Dragon Age creative director Mike Laidlaw. With the departure of studio general manager Aaron Flynn and Anthem in a desperate state, Darrah was parachuted into the Anthem team as executive producer. 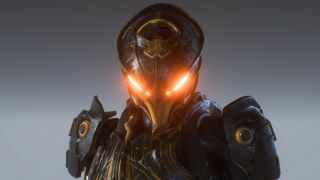 Mike Laidlaw subsequently left to join Ubisoft, and Dragon Age 4 was rebooted as BioWare poured resources into getting Anthem into a fit state for its February 2019 launch. Dragon Age 4 will be built on Anthem's codebase to avoid throwing out huge amounts of work developers put into adapting Frostbite. The report tells a torrid story of Anthem's long development. Staff changes, direction changes, and struggles with the Frostbite engine contributed to a fraught final rush towards release. It's not uncommon to see changes of direction during development as ideas are tested and thrown out, but Anthem appears to have come together in a punishing time frame for its developers. One former employee anonymously speaks of "stress casualties". BioWare has responded to the report with a statement on Anthem's development. "The health and well-being of our team members is something we take very seriously. We have built a new leadership team over the last couple of years, starting with Casey Hudson as our GM in 2017, which has helped us make big steps to improve studio culture and our creative focus." The statement doesn't challenge any of the facts in the report. Instead it says "we chose not to comment or participate in this story because we felt there was an unfair focus on specific team members and leaders, who did their absolute best to bring this totally new idea to fans." Anthem released in February, and we gave it a score of 55 in our Anthem review. It seems remarkable that the game was even as complete as it was.